In its 45 years, Intermountain Centers for Human Development has come a long, long way. 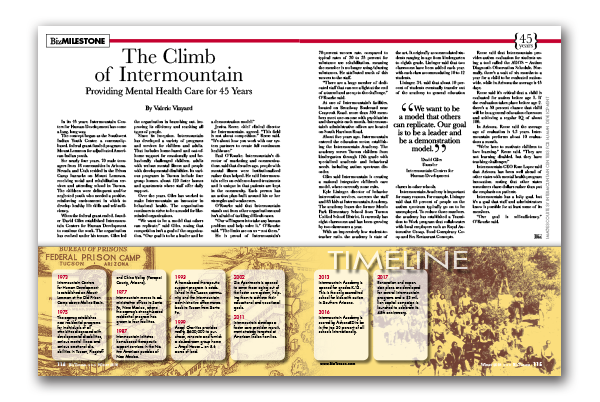 The concept began as the Southwest Indian Youth Center, a community-based, federal grant-funded program on Mount Lemmon for adjudicated American Indian youth. For nearly four years, 70 male teenagers from 18 communities in Arizona, Nevada and Utah resided in the Prison Camp barracks on Mount Lemmon, receiving social and rehabilitation services and attending school in Tucson. The children were delinquent and/or neglected youth who needed a positive, reinforcing environment in which to develop healthy life skills and self-sufficiency. When the federal grant ended, founder David Giles established Intermountain Centers for Human Development to continue the work. The organization has evolved under his tenure. Giles led the organization in branching out, improving its efficiency and reaching all types of people. Since its inception, Intermountain has developed a variety of programs and services for children and adults. That includes home-based and out-of-home support for emotionally and behaviorally challenged children, adults with serious mental illness and people with developmental disabilities. Its various programs in Tucson include four group homes, about 120 foster homes and apartments where staff offer daily support. Over the years, Giles has worked to make Intermountain an innovator in behavioral health. The organization continues to strive to be a model for like-minded organizations. Paul O’Rourke, Intermountain’s director of marketing and communications, said that decades ago, people with mental illness were institutionalized rather than helped. He said Intermountain relies on evidence-based treatments and is unique in that patients are kept in the community. Each person has an action plan built around his or her strengths and weaknesses. O’Rourke said that Intermountain stands out from other organizations and isn’t afraid of tackling difficult cases. He is proud of Intermountain’s 70-percent success rate, compared to typical rates of 30 to 35 percent for substance use rehabilitation, meaning the member is no longer using/abusing substances. He attributed much of this success to the staff. “There are a huge number of dedicated staff that can see a light at the end of a tunnel and are up to the challenge,” O’Rourke said. At one of Intermountain’s facilities, located on Broadway Boulevard near Craycroft Road, more than 500 members meet one-on-one with psychiatrists and therapists each month. Intermountain’s administrative offices are located on South Harrison Road. About five years ago, Intermountain entered the education sector, establishing the Intermountain Academy. The academy serves Tucson children from kindergarten through 12th grade with specialized academic and behavioral needs, including autism spectrum disorder. Giles said Intermountain is creating a national integrative children’s care model, where currently none exits. Kyle Lininger, director of behavior intervention services, oversees the staff and 85 kids at Intermountain Academy. The academy leases the former Menlo Park Elementary School from Tucson Unified School District. It currently has eight classrooms and has been growing by two classrooms a year. With an impressively low student-to-teacher ratio, the academy is state of the art. It originally accommodated students ranging in age from kindergarten to eighth grade. Lininger said that two classrooms have been added each year, with each class accommodating 10 to 12 students. Lininger, 34, said that about 10 percent of students eventually transfer out of the academy to general education classes in other schools. Intermountain Academy is important for many reasons. For example, Lininger said that 85 percent of people on the autism spectrum typically go on to be unemployed. To reduce those numbers, the academy has established a Transition to Work program that collaborates with local employers such as Royal Automotive Group, Food Conspiracy Co-op and Fox Restaurant Concepts. Reese said that Intermountain provides autism evaluation for students using a tool called the ADOS – Autism Diagnostic Observation Schedule. Normally, there’s a wait of six months to a year for a child to be evaluated nationwide, while in Arizona the average is 45 days. Reese said it’s critical that a child is evaluated for autism before age 5. If the evaluation takes place before age 2, there’s a 50 percent chance that child will be in a general education classroom and achieving a regular IQ of about 100. In Arizona, Reese said the average age of evaluation is 4.3 years. Intermountain performs about 10 evaluations a month. Intermountain CEO Rose Lopez said that Arizona has been well ahead of other states with mental health program innovation, noting that other states sometimes chase dollars rather than put the emphasis on patients. Intermountain has a lofty goal, but it’s a goal that staff and administrators know is possible for at least some of its members. “Our goal is self-sufficiency,” O’Rourke said.